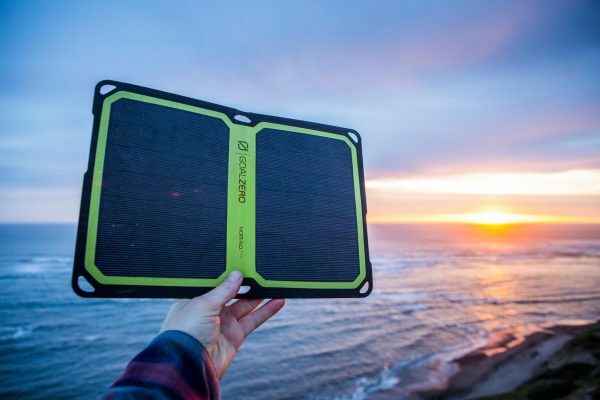 At first glance the Nomad 7 Plus from Goal Zero is just an ordinary portable solar panel with a sleek exterior that folds up like a book, but don’t judge this book by its cover. Embedded within the device is technology that will maximum power flow and keep your devices from over-charging and decreasing the life of the battery. With its dynamic auto-restart and intelligent electronics the Nomad 7 Plus will optimize output to match your device. The Nomad 7 Plus knows the difference between a device that has reached a fully charged state and one that disconnects because of a lack of sunlight. If that happens it will automatically reconnect the charging device without interruption. We had a chance recently to test out the Nomad 7 Plus and found it performed brilliantly. A solar intensity indicator lets you know when you have the panel positioned optimally to maximize sunlight. It has a small kickstand so it rests easily and a rugged shell that repels water and moisture. With the Nomad 7 Plus you have two options to charge your devices. You can either charge them directly or you can couple the panel with a portable power device such as the Nomad Sherpa 50 Power Pack or the Venture 30 Power Pack, both from Goal Zero.